Much like Xenoblade Chronicles 2, when it comes to DLC, Shantae: Half-Genie Hero is the game that keeps on giving, as WayForward have made a ton of new content for the game and today, as a way of saying thanks, a completely unexpected update has just dropped. 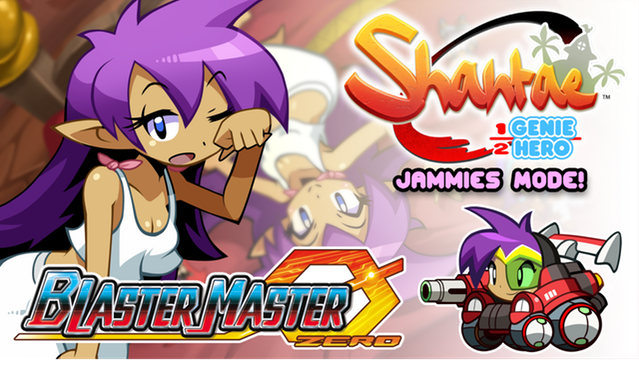 Valencia, Calif. – 7/31//2018— WayForward is pleased to announce Shantae: Jammies Mode + Blaster Master Zero Transformation Dance! Starting today, ALL versions of Shantae: Half-Genie Hero will receive a FREE content update that brings an all-new Jammies Mode and Blaster Master Zero Transformation Dance! Enjoy playing a brand new adventure in naught but your jam-jams! Pillow fight your foes, float on a dream-like cloud, and deploy sleepy sheep projectiles to deal huge damage! Also included is a new bonus Transformation Dance for use in the main Shantae adventure – change into Sophia III from Blaster Master Zero and blast enemies to bits! This update is free for all versions of Shantae: Half-Genie Hero (both the base version and Ultimate Edition) – all territories on every gaming platform! It’s our free gift to all of you for supporting Shantae: Half-Genie Hero! as always, no instructions on how to download it.. it’s not that simple for some platforms.